* The John Deere County Fair Wagon Ride sums up everything that's best about life in the country! 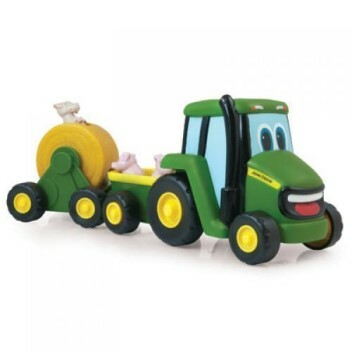 * Bobbing along behind Johnny Tractor are two trailers, full of fun and surprising farm guests! * As you push them along, the hay bale moves round and three farm animals pop their heads out of the bale. * There are three pigs coming along for the ride in the first trailer. * Push the button on top of the tractor and listen to the carnival music and animal sounds! * 2 x AA batteries included.